Every year, we like to hold the forecaster feet to the fire with having a nice, convenient place for everyone in town to come back and visit each of the local TV station winter weather outlooks. 6 ABC (November 7th): Snowfall call of 12-18" for Philadelphia, with a mild first half of winter and a possible colder and stormier second half of winter. Channel 6 believes any sustained chill should hold off until after the New Year as the Arctic Oscillation and North Atlantic Oscillation *may* flip from a general positive look to one that is more negative. Fox 29 (November 18th): Snowfall call of 16-20" for the winter, with the bulk of it projected to fall in February. Fox 29 expects a mild start to winter before January trends colder, with most of February remaining below average before temperatures recover towards month's end. 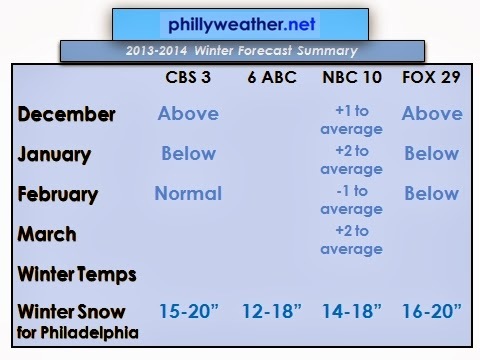 CBS 3 (November 19th): Like Fox, CBS predicting a mild start to winter before temperatures tail off in January. However, they predict a more "normal" February overall. Snowfall is projected for near normal, with 15 to 20 inches of snow expected for Philadelphia. NBC 10 (November 20th): Glenn's winter forecast is similar in tune to everyone one but a bit more specific by month, which is typical for Glenn's forecasts. Mildest conditions to average are expected in January and March, only February coming in below average overall. Snowfall projections for Philly are 14-18", slightly below average overall.